Native to eastern Asia, the perennial vine known as kudzu was introduced to the southeastern United States in the late 19th century as an ornamental plant to provide shade for porches. 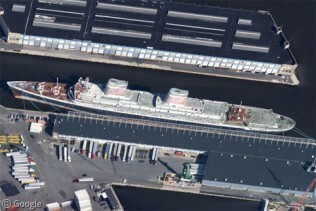 Later, the United States government distributed the plant around the region to help prevent soil erosion. The plan was too successful and ultimately backfired, as the foreign plant prospered in the southern climate and began overtaking and killing native vegetation. Growing unchecked for much of the 20th century before being placed on the Federal Noxious Weed List in 1997, kudzu now covers an estimated 30,000 km2 (11,600 sq mi) of the southeastern United States; a number that is growing at the rate of approximately 610 km2 (235 sq mi) each year. Countless millions have been spent to try and stem the spread of the plant, which can grow up to 30 cm (12 in) in a day under optimal conditions and continues to push northward and westward. Kudzu is called a ‘structural parasite’, which means that it grows on top of other plants, rocks, buildings, and structures in order to support itself and reach sunlight. Prime examples can be seen in Tennessee’s Norris Dam State Park. 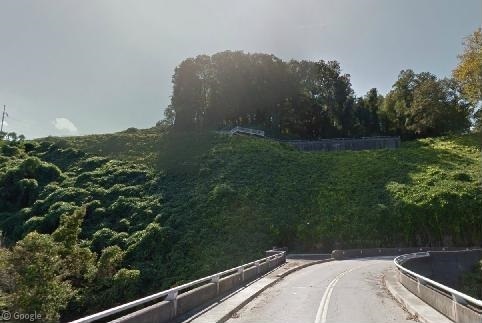 The hillside above the dam has been completely overrun, and trees along the roadside have literally been smothered to death as the advancing vines prevent the trees’ leaves from accessing sunlight. 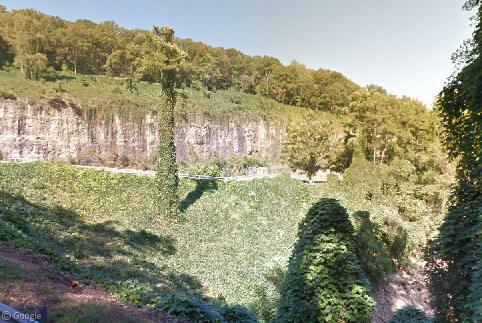 Elsewhere in Tennessee, we see another kudzu-covered hillside riddled with dead, kudzu-covered trees. 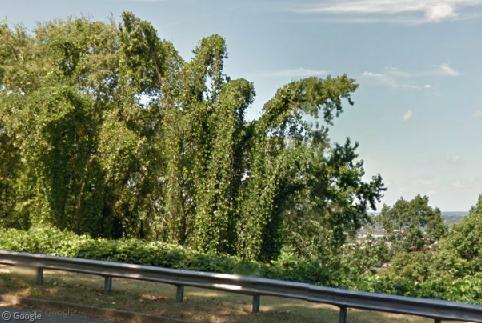 Here are some more smothered trees along this parkway in Birmingham, Alabama. 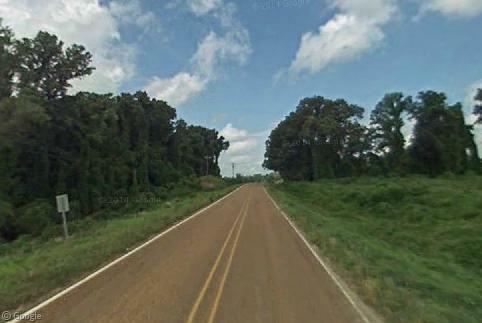 In central Mississippi, one of the areas hit hardest by kudzu infestation, we see a stretch of roadway where kudzu covers everything on both sides of the road, including the trees. 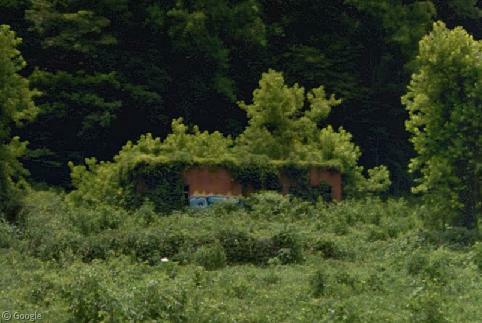 Abandoned structures are especially vulnerable to being overtaken by kudzu. 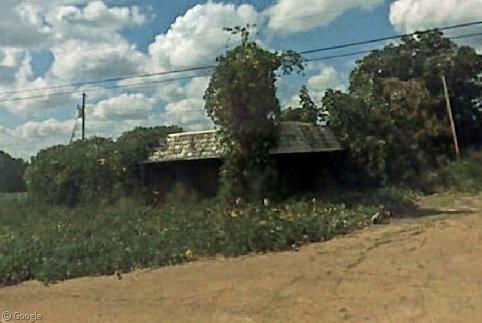 Here we see an old general store in northern Mississippi half-smothered by kudzu1. The big ‘pillar’ of kudzu in front is (was?) the store sign. 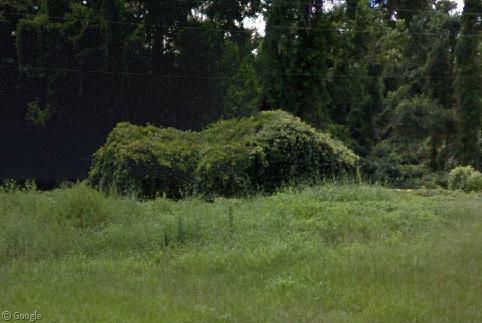 From a distance, one would be hard-pressed to guess that this mass of kudzu in the Florida panhandle even used to be a house. 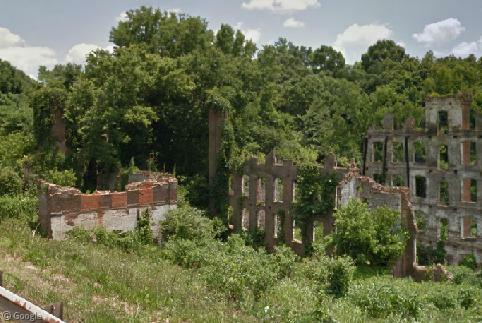 Well, at least the kudzu’s covering up the graffiti on this old foundation in North Carolina. Built in 1833, the Great Falls cotton mill in Rockingham, North Carolina was one of the oldest such mills in the southern United States. The mill remained in operation until the 1960s and was scheduled to be turned into a large museum honouring the textile industry when it burned in 1972. 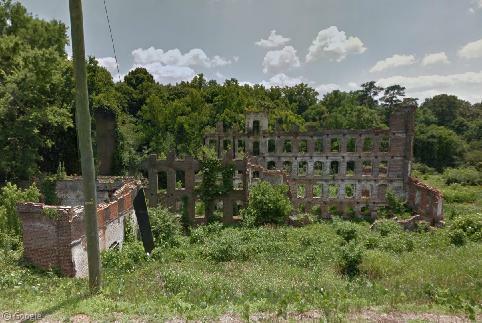 In the four decades since, kudzu has claimed the eastern half of the mill and is slowly-but-surely consuming the rest of the ruins. 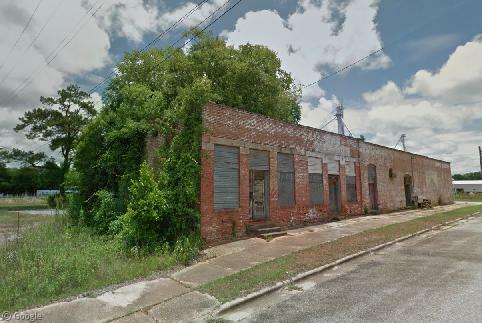 This abandoned appliance store in downtown Leary, Georgia is slowly falling victim to kudzu. 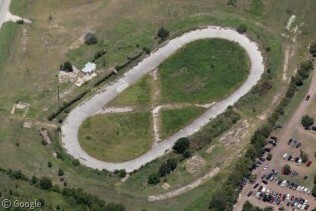 Pan around, and you’ll see other buildings, including an old service station, succumbing to the same fate. 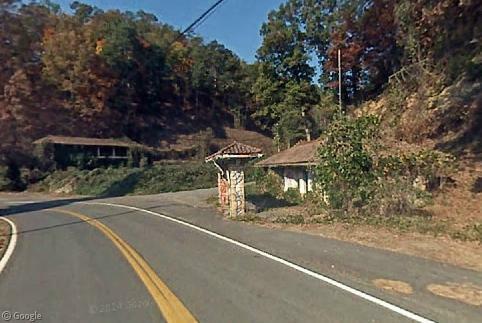 In Pressmens Home, Tennessee, we even catch two different buildings in the same view being smothered. Kudzu infestation is hardly limited to rural and abandoned areas. 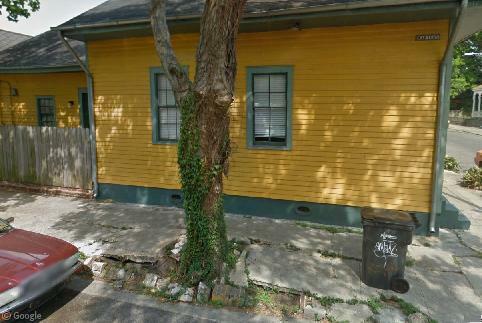 Even in the heart of New Orleans’ Marigny neighbourhood, kudzu vines are seen climbing up trees and breaking up sidewalks. 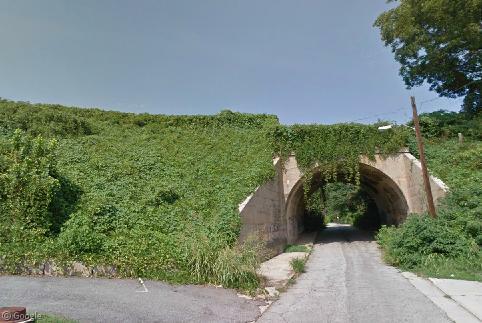 One of the most striking incidences of urban kudzu infestation can be seen in Atlanta, Georgia at this abandoned railway overpass along Jett Street. Approaching from the west, the kudzu is so thick that it looks as though one is driving into the jungle. The vines have even climbed along transmission lines to the top of the power pole. 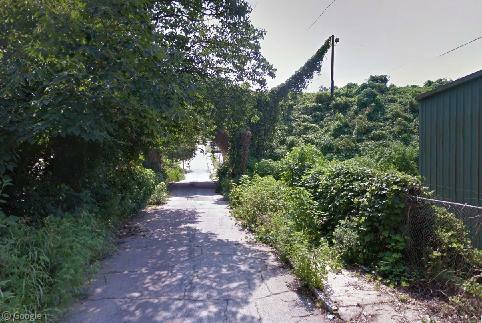 Pass through the tunnel, and you can see the entirety of the overpass is covered in kudzu, and the plant is even begin to cover the sidewalk in places. 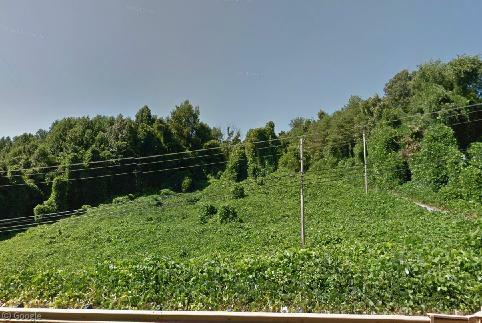 While the most effective means of kudzu control involves letting livestock feed on the runaway plant, it’s not a feasible solution inside most urban areas, meaning maintenance crews must spend countless hours each year trying to trim down and root out kudzu infestations. 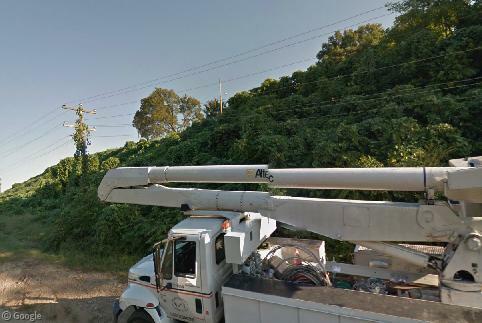 Here in Richmomd, Virginia, a crew is setting up shop on a hillside where kudzu is beginning to claim power poles, transmission lines, and native vegetation2. 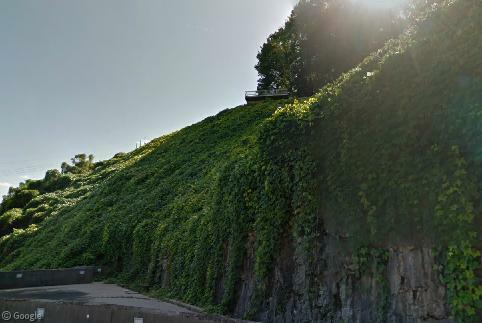 This post ends with a warning that kudzu is no longer just the southeast’s problem. Kudzu has been found in Pennsylvania and New York, and in 2009 a patch was found in southern Ontario. 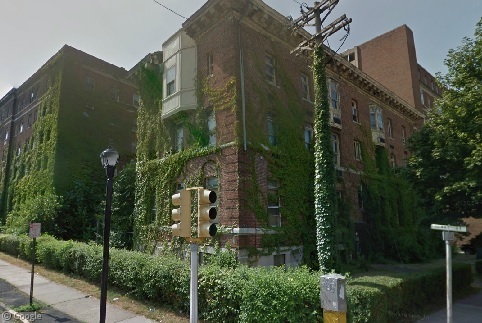 Here’s a jarring visual of how kudzu has taken over a city block in Orange, New Jersey.